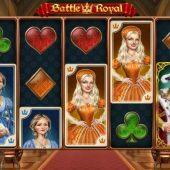 Battle Royal slot is actually a quite rare and novel game as it's based on real history, in this case the 6 wives of King Henry VIII. We do have other slots with a historical overtone but these tend to be more generalized such as Rome And Egypt and King of Macedonia but here you could be back to your schooldays when trying to recall the names of these 6 wives. The background is a royal hall and of course we spin to some medieval gentle lute music with some chopping sounds when certain wins appear, as it was easy to lose your head if you married Henry! So will our bankroll be heading for wedded bliss here or will the axe soon fall? 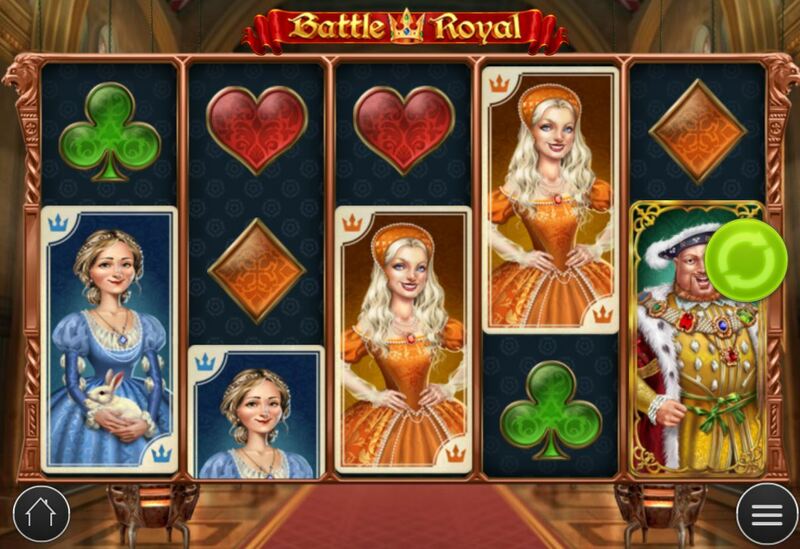 We have 20 paying lines on Battle Royal slot and all symbols appear either singly or in double-stacks. A rather jovial looking Henry VIII is the Wild and appears on all reels and awards 30x bet for 5-of-a-kind and the 6 wives aren't named but are identifiable by their dress colour. Yellow Wife also pays 30x, Orange or Red 25x, Green or Purple 20x and Blue 15x with four card suits paying 3x down to 1.5x for a full line. Before we get to the main features we do have a random event that can occur which is that any card suits in the grid can all transform into the same one after the reels stop. This will produce a win most of the time too. To trigger the features on Battle Royal you need a Shield scatter to fall on both reels 1 and 5. This will give you two Shields to pick from and you'll be awarded in most cases Long Live The King! This will take you to a vault full of chests which award cash values of 1 to 5x stake but each one you open will also let loose a ghost. Should this rush past you then no problem, carry on picking but should it cross Henry who is doing your unlocking, your bonus will end. If Henry finds a key then you can press the Escape Button which appears, to then let Henry unlock a single chest containing a multiplier, usually 2x. All your wins are then doubled. You can however choose to remain and unlock more chests before using the Escape Button in order to increase your total, but if the Ghost gets Henry then the round ends and you miss out on the multiplier chest. If you avoid getting the lesser-preferred pick-me round above, you get unlimited free spins. You pre-select one of the 6 wives who each have a cash value of 20-40x bet and if she is the last wife standing you get her value on top of the free spins total. You will now see guillotines appear over all 5 reels which is a bit of historical license from Play'n Go as firstly the guillotine was French and secondly wasn't around in the 1500's, but never mind! Now as you have already been informed above, the wives appear in double-stacks so if the head is in view of any wife on the reels and then that reel's guillotine falls, she is beheaded. She then turns into the ghost of her colour carrying her own head, also becoming Wild as the Henry Wild himself doesn't appear during these spins. The spins continue until 5 of the 6 wives have been beheaded. At that point you will get your total which Play'n Go tell us can be up to 5,000x bet plus your chosen wife's fixed amount if she is the survivor! The free games may look similar to those of Microgaming's Lost Vegas slot if you've ever played it. You get one final bit of fun too - after the above is completed you'll see the 6 wives lined up with the guillotine above them. Pick one, if the guillotine beheads her you then get the pick-me feature Long Live The King! awarded too. This will be more rewarding than triggering it via the choice of scatters as normal.